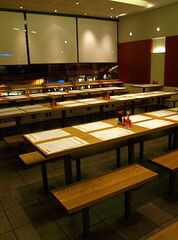 Wagamama is a chain of canteen-style noodle places sprinkled over London. The menu and prices are pretty much identical everywhere (City branches are a bit more expensive). Almost all branches do takeaway as well as eat-in, but the price is the same. The company policy is for the food to turn up at the convenience of the staff rather than that of the customers; so although they have starter-like dishes on the menus, they call them "side dishes" instead, and they may well arrive after your main. Similarly, it's very unlikely that everyone in your party will get their food at the same time. Billy has found that the tori kara age always turns up last. The food is "safe" rather than interesting, though it's generally tasty enough. The portion size is rather small, and prices rather high, for what is essentially fast food. Although their focus seems to be on repeatability, they do change the recipes a few times a year - sometimes for the worse. Specific dishes recommended by RGLers are the chilli beef ramen (Martin and Bob, though Martin says he's always hungry when he finishes it) and the miso ramen (pfig). H-L has discovered that they're happy to swap any kind of noodle for any other kind of noodle - handy if you're vegan, since some of the dishes are made with egg noodles by default. Seating is communal. The (paper) placemats will have "specials" on; sometimes these are good. The server takes your order and puts it into a wifi handset. They then write the numbers on your placemat so when the food arrives there is no confusion about which dish you ordered. Last edited 2009-02-08 19:36:42 (version 8; diff). List all versions. Page last edited 2009-02-08 19:36:42 (version 8).